The first time I was at the Cincinnati Pops was for a concert of Disney songs; I enjoyed it very much. But it doesn’t even compare to the glorious spectacle that I saw tonight. 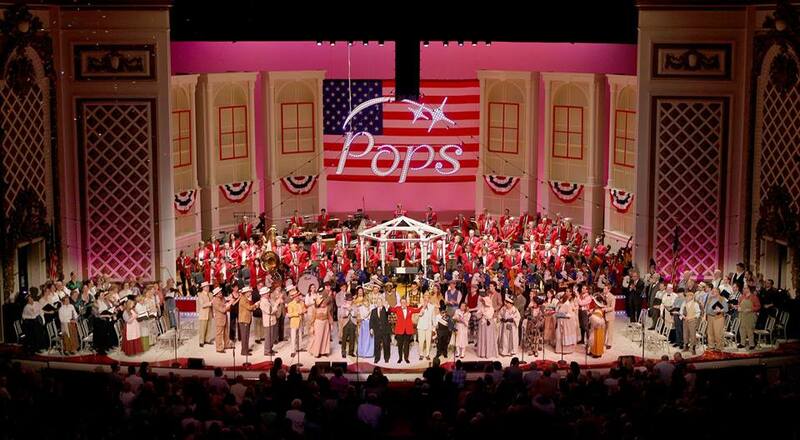 THE MUSIC MAN IN CONCERT is a wonderful production by the Pops in collaboration with The Cincinnati Playhouse in the Park’s Artistic Director, Blake Robison, CCM’s Musical Theatre Department, Walnut Hills High School, the May Festival Chorus, and others. It demonstrates everything right with the Cincinnati arts community. Frankly, it makes me proud to be a Cincinnatian. Betsy Wolfe, a graduate of CCM and now a bonafide Broadway star, plays Marion the Librarian. Her co-star is Will Chase, another Broadway star, who is now seen on the TV show “Nashville.” They both are supported by some wonderful artists, especially Michael Marotta (who was wonderful in TENDERLY at the Playhouse), high school freshman Allison Edwards, Pam Myers, Barry Mulholland, sixth-grader Trent Donk, Ben Biggers, and Patricia Linhart. Perhaps the most amazing thing about this production is that the leads only had 4 days of rehearsal to pull this gigantic production together. I would say that director Robison had his hands full – and more than succeeded. Diane Lala was instrumental in this; she choreographed the ensemble of dancers from the CCM Musical Theatre department. For me, their work is the highlight of the show – especially the elaborate dancing during “Shipoopi.” Marotta also shines here. Other standouts include the acapella numbers by vocal group “Hudson Shad,” Linhart’s subtle but effective comedic work, Chase’s frenetic renditions of the songs in Act One, and Wolfe’s stunning presence every time she walks on stage. John Morris Russell is a treasure as the conductor of the Pops; we’re lucky to have him. And we are also lucky to have people like Mrs. Linderer, who was in attendance tonight, and who recently committed ten million dollars to the renovation of Music Hall. The orchestra sounded great, the audience was having a ball, and I can’t recommend this show highly enough. Get to Music Hall tomorrow at 2 PM no matter what. Do not miss this fantastic performance! THE MUSIC MAN IN CONCERT will be performed once more, Sunday at 2pm, at Music Hall in Over the Rhine. Tickets and more information can be found here. Also, don’t forget the kickoff of the Pops at Riverbed on June 6th featuring a Broadway Sing Along!